The attendees converged in Monterey Bay to identify steps needed to improve the design and implementation of a more rational fisheries management process for North America's declining fisheries resource systems. The principal reasons why fisheries management has been so unsuccessful have never really been addressed in the fuller contexts of North American politics and shoreside industry interests, or with regard to the interplay of various market and economic processes. In contrast, placing the blame exclusively on the at-sea sector of the industry has become a theme, resulting in a continued decline in the status of fishermen and fishing cultures. This latter group is only one of many important influences on the fisheries situation, and all groups need to be evaluated in this much larger perspective. The first step in our discussion was to identify those processes and properties of both the natural ecosystems and our human impacts thereon, and then to address the information systems needed for rational and informed management decisions. Ultimately, our objectives include a clearly stated planning agenda, in order for better informed fisheries management for specifically-identified types of small, regional community fisheries. We intend to submit these suggestions and thoughts to the various agencies responsible for fisheries management procedures for both inshore and offshore fisheries. Many of the original fishing communities in the United States were initiated by colonial immigrants, from mostly Western European and East Asian fishing cultures. There also were ongoing coastal and riverine fisheries, prosecuted by indigenous Native American cultures, mostly on subsistence scales. However, the Haida and Tlingit cultures of what is now Southeast Alaska had developed a major value-added trade system based on fishing, that allowed them to obtain barter items from highland and inland Native American cultures. Most early coastal communities situated in North America were founded by fishing cultures, both before and after the Europeans arrived. Generational and historical changes in the operation of fisheries responded to many influences, from climate-driven shifts in ocean wind and precipitation patterns, through introduced technologies, to various other market developments. All of these factors should be kept in proper perspective, however, relative to overfishing as a cause of fisheries stock depletions. Several examples come to mind, such as the evolution of the Atlantic cod fisheries, as described by Mark Kurlansky in his treatise "Cod", that played such an important role in the European expansion to the Americas and elsewhere. As well, during the 18th and 19th centuries, trade in whale and fur products rose and fell, eventually stranding many ethnic islanders or people from fishing cultures throughout the Americas. Many of these new colonists fell back on fishing for subsistence, as well as for sale or trade with others, both nearby and distant. This eventually led to such unique local products as the dried squid from Monterey Bay, shipped to Asian markets starting in the 19th century. Fisheries have continued their regular pattern of rise and fall to this day. The vagaries of climate have played an important role in the pattern of human development throughout history, especially with regard to their effect on fishing activity and the cultures and trade dependent thereon. Much of the European expansion and colonization took place during the climatic cooling that followed the Medieval Warm period. That period of cooling began in the late 1100s, leading to what is called the Little Ice Age, and it led to many severe social changes throughout the world. The cooling period only ended in the mid-1800s. Disease and other sources of stress from climatic events ameliorated thereafter, and northern hemispheric cultures and industries thrived on the increased trade in fishing and other natural products. Subsistence fishing communities were subsequently founded from Labrador southward along the eastern North American coastline down to the Carolinas, as Europeans landed and colonized these areas. Their interests were often focused on exporting dried fish products to European markets, but soon expanded to servicing slave plantations and economies. The Gulf of Mexico and Florida coastal fisheries were initially based on riverine-dependent species, such as shrimp and crawdads, but eventually included smaller fishes such as sea trout, rocky shoreline snappers, and migratory predator species like king mackerels and several varieties of crabs. Along the Pacific coast, early Russian and European fisheries interests were focused on fur-bearing mammals and oil-rich whales, while indigenous fishing cultures were mostly gleaning nearshore rocky-intertidal zones for shellfish and other invertebrates, as well as for vitamin-rich algae. Wherever salmon were supported by large river systems, their spawning runs were exploited for food, to be eaten immediately or to be processed for storage until the winter season's icing closed off fishing access to the rivers and nearshore ocean. The development patterns of the Atlantic and Pacific coasts were quite dissimilar, as different arrivals were overlain upon previous cultures, both new and old. The one common pattern was that whales became a dominant target during the mid-19th century, attracting diverse ethnic groups to various centers of economic activity. Among the first recorded fisheries failures, the declines in Baltic herring of the early 15th Century can be blamed on the failure of the region's copepod production system, rather than on overfishing. This collapse was caused by a climate-driven shift in the surface wind fields, and the subsequent fall in primary production over the Baltic Sea. On the other hand, the Dutch experienced a compensatory bloom in their nearshore environment, and the center of herring production shifted to the North Sea, and as a result Dogger Bank fisheries were enhanced. This soon stimulated the growth of the Hanseatic League and expanded their influence in the fish trade, as the post-Medieval Warm Period cooled and the economic self-sufficiency of most of Europe declined. Between the influences of the ensuing Cold Epoch and the coming and going of various plagues, Europe lost significant portions of its unskilled labor force, and landlord/serf relations under feudalism began to erode. This led to an emergence of more capitalistic approaches to producing and moving products, and to new networks of trade for needed food and critical materials such as salt and spices used in food preservation procedures. The Basque salt-dried cod fisheries and whaling cultures were literally a century ahead of the rest of Europe, with respect to fishing in the western Atlantic as well as within their own local coastal environments. Soon enough, the eastern Atlantic herring and cod fisheries became very competitive and exclusive, eventually leading to punitive killings and several wars over ocean access. Meanwhile, the markets for salt-dried cod were expanding, along with the whale oil markets, creating limiting situations in which market demand could not be met from local resources alone. The Age of Exploration began, funded by capitalists and based on the experience of fishermen-sailors, to man the fleets with experienced naval officers to navigate the seas (c.f., Braudel, Wheels of Commerce, 1983). Not surprisingly, many of these adventurous global navigators came from fishing cultures, particularly those of Viking descent and then later the Basques (Kurlansky, Basque History of the World, 1999). As North America's coastlines were colonized, the local river and estuarine resources were reputed as being particularly fruitful and easy to exploit. The initial developments were region specific. In the North Pacific, the focus was on pelts traded in Asia for silver. Along the western Atlantic, dried salt codfish and whales for lamp oil dominated the industry, as the Hudson Bay Company worked its way over the northern Canadian shorelines and rivers until they reached Alaska, where they came into juxtaposition with Russian fur trading activities. The enterprising Russian fur traders had made their way from the Aleutians across Alaska and down the western coast of North America as far as Cape Mendocino, but they were simply unable to secure the logistic support necessary to compete and thrive in locations so distant from their own political power center in St. Petersburg. They were forced to abandon the northwest coast at about the same time that American colonists were induced to move westward into the Washington - Oregon - California region. This shift of control and the general economic history of the development of the Pacific basin has been eloquently described by Mcdougall in his Let the Sea Make a Noise (1993). The Spanish colonies along the West Coast of North America were principally founded upon the hide and tallow trade. They were vested in little more than subsistence farming, based around the several missions that used indigenous Neolithic cultures as labor sources. During the early 19th century, these Spanish colonies began a slow decline as the other European nations started to compete for coastal access points with various whaling and fur-trapping enterprises. The discovery of gold in California and Alaska caused a complete breakdown of Spanish and Russian influence along the Pacific coastline, and eventually led to their exclusion from what is now the United States of America. By around 1880, as whale oil was replaced by petroleum products, the economies of these ventures collapsed, stranding several fishing cultures: Azoreans, Madeirans, Basques, and even some Yankee whalers. Many of the West Coast's fishing communities emerged from these economic events. Just as important to the pattern of U.S. fisheries development is the fact that the transcontinental railroads, and the eventual North-South lines that were built to service the west coast mining and timber industries, were built by imported Chinese "coolie" workers, many of whom were also from fishing cultures. In order to feed the innumerable laborers, protein resources were needed, and the Chinese went to work fishing for squid and other sustenance in the San Francisco Bay and Monterey Bay areas. Within a few decades, once the railroad beds were completed, these immigrants were free to develop their own products for home markets in Asia. Dried squid formed one of the West Coast's first fisheries exports, although most of the salmon canneries that functioned during the late 1800s were focused on providing abundant, transportable fish protein for the laborers in the West. Similarly, the Eastern Seaboard had begun to develop its own canning industries for herring, oysters, and eventually salmon. Much of this product was consumed by laborers, and became the basis of an affordable protein consumption pattern that pervades American households to this day. The two World Wars created another boom period for coastal fisheries, as canned rations were needed around the world to feed soldiers, sailors, and airmen. The issue of "overfishing" must be addressed at the outset as well, to clarify and avoid any suspicion of "hidden agendas" here. Within the single-species approach to ocean resource management - where levels of fishing are presumed to be the only significant causative variable to be considered - any depletion of fisheries stocks is also attributed to, and therefore is usually blamed on, a pattern of overfishing. But overfishing - although an important part of the problem - is not the only aspect of fisheries stock growth and decline, nor is it generally the dominant or most important factor in such situations. The entire concept of linear equilibrium modeling of ocean ecologies should and will be criticized here, as a fundamental part of the problem addressed in this report, instead of simply being appended to the end of our discussions, as is too often the case in most fishery management debates. We consider an ecosystem-based management approach to be essential to any and all potential improvements in fisheries management to be made in the near future. Therein lies our principal motivation for this meeting; the adoption of a "systems" approach will be an important focus of our efforts to address what must be done to rationalize North America's fisheries management problems. Fresh fish was historically a locally available, abundant commodity, priced in many cases at a much lower level than other meats, particularly beef and poultry. It was only with the advent of salting, icing, and then freezing techniques, that fresh fish could be distributed beyond specific coastal limits. Today, fresh or frozen fish products can be delivered within hours or days to markets halfway around the world, using modern air transportation. This ability has changed the world, and has actually encouraged excessive exploitation rates of many valuable fisheries resources. For example, an Atlantic bluefin tuna can be caught, processed, and delivered either on ice, or flash-frozen, to be sold in Tokyo's Tsukiji Fish Market, or in many other similar high-volume markets all over the world, within 24 hours. Fishermen appear to have lost touch with the basic economic fact that they are mostly competing amongst themselves to achieve lower prices, overall, when they enter "derby fisheries", or other short season, over-supply situations. Buyers love to see a fleet arriving at the dock, loaded to the gunwales with a valuable market fish. They can, and will offer less, and buy from the fishermen who will take the least for their catches, leaving all the fishermen with less than a carefully controlled delivery rate system would offer. The local "industries' at one time offered ice-houses and other storage facilities, as they also recognized the need to parse out the resources, and not saturate any of their accessible markets. The transportation and freezer systems have evolved, and make these local facilities less necessary. The end result is a lesser landing value for most fishes due to inter-fishery competition for limited markets. The only saving grace is that the "quality" of natural fresh fish is a positive characteristic, that can substantially improve the landed values of individual catches, given that the landing rates do not exceed demands, and saturate the markets. These new market forces are among the major causes of overfishing; they need closer examination and perhaps regulation, if global fisheries are to thrive. The question - from a "systems" perspective - is how to encourage localization of fishing activity and consumption, to tighten causal "feedback loops." Too often there also seems to be a large price differential between what fisherfolk get for their product at the dock and what consumers pay for fresh fish in the market. We see this price spread as an opportunity for profitable entry into local markets by local fishermen (though obstructive regulations likely exist in large part to protect processor profits from this sort of competitive force). As for changing fishermen's "attitudes" about their ecological impact - is that really an option? How one might "engineer" such a change is not at all clear, short of a larger cultural shift. This has happened in many civilizations in earlier times. Having said that, it is also surely the case that exploitation for short-term personal gain should not be encouraged by our fisheries management practices, such as is the case with ITQs and other privatization schemes. The same thing could be said as well about encouraging shortsightedness of any sort, through incentives and behaviors that do not account for enduring consequences, such as those that damage the long term viability of any aquatic ecosystem, or that threaten critical components thereof, such as water quality, habitat diversity, and species compositions. This implies a truly systems-based , involving all economic participants and not just active fishermen. Is it possible to manage fisheries effectively when they occur mostly out of sight of land and beyond the enforcement capabilities of fisheries management authorities, when these fisheries are pursued under various modes, flags of convenience, and disparate ethical bases? Apparently not, at least in the absence of viable and cohesive fishing communities and cultures. Perhaps the most effective management tools have yet to be implemented or even developed in fisheries contexts. Regulation of flow-through rates across world markets would seem to be an effective management tool, as such market regulations would be more directly enforceable, and less prone to evasion than the present catch-based regulation of landings and fishing effort. Perhaps the motivations and patterns of behavior of fishermen would change, if they were fishing for market orders, under pre-specified values, rather than the present system of competitive derby-fishing, which is ecologically unsustainable, economically inefficient and often market-saturating. Some sort of "value pricing" element may also be needed here, reflecting the very real worth of fish in the wild with respect to their ecological, reproductive and other services. Such a pricing system would be designed to incorporate some of the "social costs" of fish removals into the private decisions of fishermen. Of course, the ultimate effectiveness of any such changes would depend upon the fishermen's own attitudes about their role in fisheries. Given their currently very small portion of the profits derived from sales, they could improve their market position by minimizing competitive overharvests, and the resulting concentration of catches - with the associated lower prices - at the docks. On the other hand, the fisheries management system could also be advanced to a better strategic position, much like that existing before the passage of the Magnuson-Stevens Fishery Conservation and Management Act of 1976 (M-SFCMA), through a more cooperative approach to oceanic information gathering. Under a more market-based regulatory system, information flow from fishing vessels and processors would provide the insights needed to truly manage removals of various species-specific components of complexly-interdependent regional ocean ecosystems. Management should consider multiple species in an ecological context, rather than the conventional single-species catch-based methods that have proven so unsuccessful in practice and effect. Whether such broad-based regulation is managed through "value prices" on resource removals or by downstream market controls is less important than recognizing the need to think about the whole process differently, and in a more comprehensive frame of complex causal influences. Under the provisions of the M-SFCMA, open and honest collaborations between fishermen, fisheries scientists, and the Regional Fisheries Management Councils, where fisheries management is debated and eventually implemented, have become nearly impossible. The fisheries scientist (or onboard observer) is perceived to be a "fish cop" by the average fisherman. Because of these suspicions and the widespread distrust generated thereby, several "proxy" information sets have been developed as fisheries management tools. These started with voluntary logbooks, which soon became mandatory; then onboard observers were proposed and later required, as the accuracy of logbook data was increasingly questioned as subject to considerable uncertainties. In fact, the word "uncertainty" has become the single most abused "avoidance device" in fisheries management, as the numbers and types of detailed information that are crucial to enlightened fisheries management dwindled and disappeared, at least in terms of their credibility and reliability. Also, what we do know about the relations between fisheries stocks and ocean variability is not being put to any good use in our fisheries management systems. Worse, the daily changes that fishermen see, note, and evaluate over their somewhat better sampling of the oceans is being lost. Thus our ability to interpret changes in catch rates, specific contents, and fish characteristics is blunted, if not completely erased, by the absence of necessary empirical information. Only three decades in the past, fishermen were initiating collaborative efforts to explore and share ocean and fisheries information with scientists in the pre-NOAA Bureau of Commercial Fisheries. Major programs evolved after World War II, including in one case the most informative ocean ecosystem research program ever devised and implemented: the California Cooperative Fisheries Investigations (CalCOFI). The original intent of the guiding group that initiated this program was a better understanding of the oceans, by compiling and cataloging the various life history stages of all ecosystem components and their ongoing responses to known climate-driven ocean patterns. Despite these early efforts by a few wise, forward-looking scientists, the enacting of the M-SFCMA has caused the nearly complete collapse of this and many other related ocean observing systems. A more robust CalCOFI Program not only would support fisheries management in the California current, but also would provide information and insights that could be useful in other eastern boundary current regions, from which comes a significant portion of the total world fisheries catch. Among the other complications of North America's ocean fisheries have been attempts to wall off portions of its oceans and coastlines, based on ïvena economic concepts of "privatization" of sea and landscapes through allocation of ITQs, or creation of Marine Protected Areas. This includes, of course and applies to offshore aquaculture. In some sense MPA's that restrict fishing activities for various users, but not all others, are simply reallocations - with restrictive objectives - some of which affect one group, but not another. We should also not forget the designations of personal playgrounds for specific user groups, e.g., the spearfishers, jet-skiers, scuba divers, etc. The analog is the use of barbed wire in the Old West, with which large tracts of open rangeland were "claimed" for specific users, precluding adaptive flexibility in land use as epochs of climate/weather patterns shifted. Since climate and the resulting weather are in continual flux, there are no individual "landowners" with large enough tracts to survive the often more than twenty year-long droughts or famines that such shifts bring. Under these climatic conditions, it is not difficult to reason out why most large plains or veldt environments were originally inhabited by highly mobile cultures of nomadic herders and hunters. Although irrigation projects and other relatively short-term engineering "fixes" have become the norm in American agriculture, they do not insure against known long-term climatic variabilities. Most recent developments of this sort have been designed around available climate measurements made during the past century, or over even shorter periods. James Goodridge, former California State Climatologist, has produced several revisions of the region's climate expectations, in which his own original estimates of climate variability during his official professional life from 1950 to his recent retirement were newly discovered to be unrealistic. His early estimates of "return rates" of major storms ranging from periods of decades to thousands of years turned out to be severely underestimated, as the climate patterns of the 1980-2000 period demonstrated. What had been deemed a thousand-year storm has now been shortened to less than a century, and what were 20-100 year events, are now expected to return on much shorter decadal time scales. Similarly, seafarers have learned that every year is unique, within certain seasonal limits. Over a span of 60-80 years, there will be at least two periods of distinct ocean current and wind field patterns that lead to specific changes in the naturally-occuring populations of fishes, mammals, and birds that appear within the bounds of fairly well-defined coastal and offshore regions. These are not new concepts. They have been the basis for survival of hunters, fishers, and farmers since the beginning of humanity. We need to incorporate such factors into our own understanding and resource management practices. Indeed, it is exceedingly strange that we have not yet done so. Denial of these basics seems to have been built into fisheries population or stock assessment "models" created by North American and European academics, as they wrangled over how to minimize the effects of humans on local or regional fisheries. While most fisheries stock assessments are made from measures of catch, simple landings data are inadequate for proactive fisheries management, as one might surmise from the uncertain dynamics of climate and weather, each of which has its direct effects on fish population dynamics, ecosystems, and fishing operations. The most frustrating concept developed by these studious academics has been that of "single-species fisheries management," in which each fish and its fishery are treated as independent entities, functioning in isolation, outside the context of the ecosystems in which they are fully embedded and interact with everything else. The "fix" for this sterile approach was supposed to come from developing "multi-species stock assessment models," but the simplistic way in which these pseudo-scientific conceptions were developed simply compounded the earlier practices, and failed to include any real understanding of the dominant climate/ocean-related processes. So were even more complex errors spawned in the name of science, instead of improving the credibility of the fisheries management process. Facing these issues is the most important and urgent challenge to our present fisheries management system and the science on which it stands, at least as conventionally practiced. This, however, is not the only source of irrationality in the way we manage our resources. 6 Can any Fishery System Be Managed By Regulating Only Catch? Given what we already know about the patterns, long and short term, of ocean climates and consequent fisheries variations, the answer is a definite "No!" A fisheries management approach based on catch and effort management alone does not address the numerous processes independent of catch, that ultimately lead to variations of both the distributions and abundance of living resources, particularly those of ocean fishes. It appears that we have become bogged down in the "techniques" of management, at the expense of attention to these larger contextual requirements of truly rational fisheries management. The result is a serious loss of management effectiveness and credibility, where what little effort takes place is often too late to be useful (BCF. Parrish 2000). The inherited "disease" seems to rise from monastic models of science education, in which each field of science and mathematics is disconnected and only taught in isolation from its potential transdisciplinary applications. For example, mathematics is taught by abstract theoreticians, without sufficient attention to its specific contextual applications. Mathematics in biology is used by theoretical population modelers, whose interests lie more in pure theory than in its useful application, with models that - tested against Nature's laboratory - are too often found not to fit real data, or to provide any clear understanding of complex ecosystems and their actual status or mode of function. Peer review of publications tends to reinforce a use of arcane and irrelevant methods, rather than to reward true innovation and change, or practical learning. The science funding process through government supported research grants seems as well to encourage narrowness, at the expense of larger perspectives and/or "systems" approaches. How one addresses this problem effectively is an important challenge that remains largely unexplored and unmet. Yet it desperately needs our attention. Most "conventional" population management theories are based on the concept of equilibrium, a state that is abhorred in Nature, especially over time. Others employ "Bayesian" logic, often leading to dead ends as well. These inherently short-term models serve more to frustrate long-term management efforts than to contribute any enduring solutions. Ecosystems and their necessary diversity require regular, periodic perturbations, or they tend to monotony or collapse. Static systems are not alive: it is precisely the ongoing variability of Nature that provides for its fruitful and abundant diversity. Living systems simply are not "stable" in this sense; seeing or modeling them in this way involves serious error, at the risk of potentially irreversible ecological loss. In fact, a review of the life history of organisms in any habitat will likely educate us on the full ranges of variability that they can survive in any local evolving regime. If a fish takes two years from hatching to sexual maturity, and the oldest individuals are five to six years of age, you can assume that these species must be able to cope with up to six years of recruitment failure. The six-year age span allows at least one year class to be left after even such a debilitating period to initiate another life cycle. The fact that these cycles tend to run in patterns of several good years, followed by less fertile periods, results in the patterns of bloom and collapse that we observe in nearly every environment. Species that mature after four or more years, and that live twenty or thirty years, provide yet another strategy for coping with habitat variations. Such species are more responsive to the standard solar cycle, the effects of which can be observed in most of earth's hydrologic systems. The next most common varieties of fish are those that live to between fifty and ninety years of age, but have very extended periods in the early stages of their life history during which they are carried about by the motion of ocean currents. These relatively long-lived species - including the cods, rockfishes, and some lake species such as Arctic char and sturgeon - cycle through a long-term pattern of fertility and decline over potentially wide distributions sufficient to ensure their enduring survival. It is the very diversity and adaptability of such species that protects them from extinction due to climatic and other important environmental shifts. But nowhere in the "stock assessment" manuals are these complexly interactive contextual dynamics (within which all fishery resource populations are embedded) addressed as other than arbitrary artifacts of various mathematical abstractions. They ought instead to be included as explicit, measurable and important considerations in the long-term dynamics of individual fisheries. Otherwise, these populations cannot be understood in their diverse cyclical patterns, both in nature and - consequently - as affected by fishing activity. Even as smart mammals, we humans tend to be anthropocentric, often ïvelyna optimistic, believing that everything runs in our favor - even if we abuse Nature's rules. Since the early Chinese invented writing, there have been volumes prepared documenting the social and ecological consequences of both long and short-term climate regime shifts. These shifts have motivated the rise and decline of cultures and civilizations, explaining when local populations thrive, starve, or move on. The problem today is that there are no realms of untapped abundance left to migrate toward during lean times. Over recent millennia, a general warming (that caused the recession of the last Ice Age glaciers) has nurtured human development and population growth. Remember that it was only five hundred years ago that a brief Cold Epoch brought much of humanity into a state of decline and motion. The recent fifty-year period at the close of the Twentieth Century has been amongst the most benevolent periods observed in the available climate records. The present human population size of six billion will not survive any hint of Global Cooling, with its associated decline in the hydrologic cycle and its increased requirements for energy, both to warm our homes and to propel our technologies, in sustaining current population. Our vulnerability to climate trends that we understand so poorly - and that we cannot control - is frightening, to say the least, given historical perspectives on possible events. Proper resource management calls for careful monitoring of climate-related System Variables, such as wind fields and the resulting ocean temperatures and currents, all resource production and ecosystem changes that are completely independent of human behavior. These global forces provide the contexts of fisheries' productivity, and define the limits of any options for human intervention. Moving from natural variabilities to anthropogenic changes is the next step toward defining what we already know, what we need to know, and where to focus our scientific research efforts with respect to observation and information sharing activities. We must be able to discriminate between natural and anthropogenic changes, and manage our resources within this larger context of understanding, i.e., in a manner that is responsive to changes of either type. This sort of approach - and the perspectives arising therefrom - will allow us to manage human activities for the best outcomes within these longer time frames and on a larger regional basis specified by ecosystem requirements. This sounds easy enough in theory, although before it is practically possible to make any progress in this direction, we have a "broken system" to fix. The recent century's failures in the application of science to resource management have caused a major credibility gap between science, government and the public. Unfortunately, with the rapid advances of democracy, the evolution of our approach to management of the "commons" has not been toward greater responsiveness to the limited resource problems that have emerged in the last hundred years. 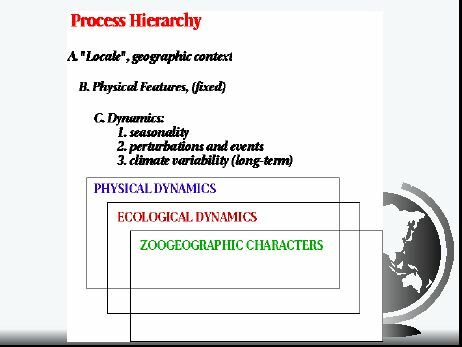 The models use d, as previously discussed, are simply not appropriate for representing continuously varying, complex ecological systems. Also, multiple political processes tend to shift the baselines that must be understood to cope with these sweeping social and natural changes. In consequence, the whole evidentiary foundation of fisheries management policy has become shrouded in doubt, at the cost of its credibility. One result of the general recognition of the lags between system changes, and political actions to conserve options, has been the "Precautionary Principles, initiated by the FAO Fisheries Department, to be debated and included amongst products of the Rio Accords. It is an observable fact that many U.S. fisheries resources have declined dramatically over the last half century, starting with the collapse of the massive California sardine fishery that peaked in 1936, and began to decline thereafter. The final demise of this fishery was assured by the World War II "troop feeding effort"; the California sardine virtually disappeared during the early 1950s, just before a long-overdue fisheries management system was introduced. The sardine fleet was dissipated, sold along with the canneries, and much of it moved to Peru and down into southern California, where it took advantage of the abundant anchovies in both locations. We now know that there is a nearly universal shift from sardines to anchovy (or anchoveta), in each ecosystem where these species occur in a region's fisheries. In fact, we can forecast these transitions nearly four years in advance, by looking at integrative physical measures such as the earth's Rotation Rate (or Length of Day) records, according to [ Klyashtorin.L.B. 1998, Long-term climate change and main commercial fish production in the Atlantic and Pacific. Fisheries Research 37: 115-125.1998. Girs, A.A. 1971 Macrocirculation method for long-term meteorological prognosis, Hidrometizdat Publ.,Leningrad, pp480. (in Russian)]. Such insights should be incorporated into the fisheries management process, within a longer-term view of overall ecological and climatic systems. The existing credibility gap between science, government and the public, as already noted, has caused an emergent crisis in resource management. Rational and efficient coordination of fishing activity is thwarted when there is no single universally acknowledged authority with the sole and ultimate responsibility for policy-making. The models currently in use are simply not appropriate for the analysis of continuously varying, complex ecological systems. Also, multiple-layered political processes tend to increase the complexity of the interacting political, economic, ecological, and hydrographic systems. How should managers think and react in the presence of multiple (and often conflicting) centers of authority? Typically, any controlling authority aims to entrench its power position. With respect to fisheries management, this sort of behavior has led to interpreting any collapse of a fishery as the result of overfishing, when the actual cause often arises from an evolving climate, resulting in other ecosystem changes and developments. Also, opposing political interests seeking to deprive fishing communities of their rights and power resist and try to thwart the task of obtaining adequate data, particularly the all-important environmental measurements or samples of fish hard parts (e.g., otoliths, scales, stomach content samples, etc.) required to determine the timing and the possible causes of decreased recruitment. We know that climate-driven changes occur in cyclical fashion, with several adjustment phases showing up in predictable patterns among the diverse species in each region. While all this is going on, upstream shifts in habitat, as a result of land-based economic development and water use changes, simultaneously shift the baselines of each species involved. All these factors must be understood if we are to cope with these complex shifts in natural and social environments. In ocean fisheries the transition from one dominant species to another is mired in yet another set of myths from the theoretical fisheries science community. It has been said that the solution to fisheries management problems is to move fishing effort from a declining species onto another, already extant but under-utilized species, given the first signs of collapse of a resource. This strategy is completely without merit in most cases, as such transitions usually involve a set of faunas tuned to continually adapting climatic conditions. The shift from one faunal bloom to the second faunal emergence begins with both being in somewhat debilitated states. As the first species declines from dominance, the second is just beginning to grow from a very low level, due to a shift in environmental conditions (such as the sardine-anchovy, or herring-cod dualities). This situation therefore requires that once one dominant species begins to collapse, the alternative species should be more rigorously protected than is the case today, until it reaches its full geographic extension, and begins to build local biomass. Conversely, the declining species (such as the collapsing Peruvian anchoveta) should continue to be exploited, but at lower rates, and its range carefully monitored to ensure that the species is never in danger of being eliminated from any of its potential refuges by overly extensive fishing activity. These climate-driven cycles are no longer debatable. The strategies for fisheries management ought to be carefully tuned to recognize and incorporate these cycles, particularly now that it is feasible to predict these cycles with sufficient accuracy to allow proactive, anticipatory management strategies in this situation. According to the reasoning of various groups concerned with climate-driven aquatic ecology, this sort of prediction has indeed become possible. Leonid Klyashtorin (1998, FAO in press) has rediscovered several Russian geophysicists' work on atmospheric climate indices. For example, the recently deceased Russian scientist, A.A. Girs, developed what he called the Atmospheric Climate Index (ACI). The figure appearing here exhibits the Atmospheric Climate Indices between 1900 and 2000 plotted against the summed Atlantic and Pacific Ocean commercial landings data for the major fisheries. ACI(W-E) designates periods when the dominant surface wind fields are zonal (east or west), and ACI(C) indicates the periods when the wind fields are predominantly meridional (north or south). The insights can be summed up in two simple graphs, the first showing the patterns of the ACI and major regional fish catches (above), and the other revealing the patterns of rising and falling resources in each ocean basin, associated with the two phases in the ACI (i.e., the dominant wind directions for large areas of the world's oceans). The rise and fall of major ocean fisheries in both the Atlantic and Pacific Oceans also turn out to be coherently related to the Earth's rotation rate or its inverse, the Length of Day (LOD). The graphs below illustrate this cyclic climate pattern by showing the two sets of fish populations that comprise any region's fisheries. There is one set that thrives during what has been termed the Warm Periods, and another that thrives during what have been termed the Cold Periods. In most cases the Cold Period is characterized by an intense upwelling in the eastern boundary currents, while the Warm periods show less upwelling, and a consequentially greater influence of offshore oceanic environments on coastal ecosystems. With better long-term fisheries data and the associated oceanographic measurements, this shift pattern would be more clearly documentable in the historical record. The lamentable fact is that these data are not currently even being gathered or assembled in any adequate manner by professional fisheries scientists. The ability to forecast these important climate-driven transitions comes from the observation that these ACI indices are patterned, cyclical, and tend to lead the major resource blooms and declines by several years. Consequently, the chief advantage of such leading indicators of major resource shifts is to open the way for proactive fisheries management efforts. The most important point of all this is that while one set of regional ecosystem components is in decline, another is also emergent. The problem and hazard lies in the fact that, during such transitions, both resources are vulnerable to overfishing and thus need careful management. Our present laissez-faire approach lets fisheries run free until and unless they reach a state of disaster. This style of management is both unscientific and dangerous if we are ever to enjoy the fullest benefits from our ecological life-support and other natural resource systems. Worse, none of these processes solve - or even address - any ongoing problems of habitat degradation or the originating upstream perturbations from poorly planned economic development and land use. Again, the absence of ecosystem awareness shrinks our resource options, due to our lack of attention thereto. While this climatic scenario especially applies to species that are cyclically responsive to environmental regime shifts, such as sardines and anchovies, it may not directly apply to species without such tight ecological linkages. For instance, the population dynamics of the various tropical tunas and billfish species do not show any such direct climatic linkages. However, as they feed on coastal pelagics at lower trophic levels subject to these cyclic relations, tunas and other predators are indirectly affected by these environmental regime shifts as well. For our purposes, these examples simply serve as inducements to use the information in hand, and to gather more observations, in order to improve our present system of ocean resource management. The additional emphasis on forecasting these major decadal scale transitions has the potential to be an important breakthrough in ecosystem science, as well as a pivotal opportunity for fisheries management. One result of the inevitable lags between our recognition of ecological system changes and our political responses thereto has been the "Precautionary Principle," initiated by the FAO Fisheries Department, to be debated at great length, and included amongst the many products of the Rio Accords. The intent was clear and appropriate: when in doubt, be conservative and gather more information. Unfortunately, there is a great diversity of views on what precautions to take. The use of outright "prohibition" of fishing activity - as an extreme reaction - too often leads to conflicts between vested interests, rather than to long-term solutions, while frequently yielding outcomes opposite to those intended. Despite what seems like a good idea - i.e., the reversal of the burden of proof for conducting a fishery - all that the reversal of burden of proof has done is saddle fishermen with another financial burden, and in some cases a logistical burden (to get research done) that they are ill-prepared to deal with. Does this mean that, for example only, that responsible management agency jobs just got a lot easier? Or that they are unable to carry out their respective jobs? A-1 priority should be to make guidelines for the use of the precautionary approach, both ecologically and sociologically (culture-community). With so many use groups involved (and their varying perception of solutions) a strong set of guidelines is necessary to get anything useful done. Then the responsible agencies need to set up protocols for experimental fisheries that are more rigorous than the existing survey schemes that have been offered and ascribed to. More direct observations are needed, followed by a careful interpretation of all available evidence. As well, fishing industry interests should adopt a larger perspective, adjusting to periods of naturally lowered productivity instead of always seeking to "pump up" production by overharvesting resources. This shift in awareness should be encouraged through carefully planned collaborations between those working within our fisheries systems, and not by remotely-controlled politicians and legislative entities, all of which tend to squander the few available funds without increasing the vital information needed for effective fisheries management. Too often some "proxy" or imputation procedure that fails to address real questions is used to cope with perceived emergencies in the face of inadequate knowledge. The need for more and better empirical observations analyzed within a larger frame is what is required to manage such cases successfully. This suggests that the fishing community ought to work closely with the scientists, which should allow them both to achieve a more realistic and better informed understanding of ocean ecologies and the effects thereon of fishing activity. Fishermen are the best source of real-world observations. We have too many examples where the results from agency sampling gear working the same locations at the same time simply do not compare well with those from commercial fishing methods. Many do not wish to face the fact that humans are competitors for fish. To those vested in conservation, control of predators such as seals or birds makes little sense. Yet as a locale begins to lose fish, mammal and bird populations will of necessity move or decline, as their food supplies dwindle. In order to maintain sustainable levels of forage for all competitors, a more effective fisheries management system based on cooperation and accurate information is urgently needed, based on all ecosystem components in their full interactions. What many tend to forget are the centuries of effort to eliminate "pest" species, such as bears, wolves, coyotes, foxes, killer bees, mosquitoes, flies, and myriad other competitor species. Also missing from the present framework is the concept that most of the fisheries that are now in collapse were relatively recently bloomed, from previous low levels, despite previous management histories. The major debilities are arising from at least three separate sources , each with uniquely varying the time scales. One is the natural environmental patterning - and ecosystem responses. The second is the overlay of fisheries, amongst the natural, often recovering competing predators. The third is through anthropogenic habitat degradation, upstream, and along the coasts and shelves. The increasing frequency and intensities of incidents or events that human's non-fishing industries have created, i.e, three major oil spills in Brazil, two in France, one in South Africa's penguin habitat, and a pesticide introduction in the northeast US that contributed to another lobster die-off, all within the year 2000. Another complication is that many fishing regulations seem to target commercial over recreational fishing. Recreational and charter-boat fisheries may actually take more fish out of some resource systems than do commercial fishermen. Certain areas, such as in the Gulf of Mexico and Caribbean, have been dominated for decades by mostly charter-boat fisheries, although only commercial fisheries are rigorously managed. This has led to a shift in management emphasis from biological conservation to sustaining local profits, producing a serious social rift between these two types of fishing. A tripartite distinction needs to be made between commercial catches, charter-boat commercialism (for "recreational entertainment "), and true recreational fishing (by private individuals ). All three operate very differently in terms of motivation and their impact on any fishery, as well as with respect to their ecological sensitivity and awareness. Charter boats may often have the worst effects on local resources and critical aggregations of fish, vital to the life histories of individual populations. Each of these three types of fishing call for regulations specifically fit to their requirements and diverse situations, especially with respect to their harvest levels and ecological impacts. Another source of environmental conflict derives from the many lessons learned from the whaling era, in which unmonitored operations taking place well over the horizon, i.e., off Antarctica, Labrador, and distant Pacific Islands, led to complete losses of entire populations and near extinctions of others. The Marine Mammal Protection Act (MMPA) emerged from the tuna-dolphin dilemma of the early 1970s in the eastern Pacific Ocean. International concerns over exploitation of already endangered species led to the CITES and ESA listings of various fish populations. A growing environmental movement and often over zealous application of new environmental laws have complicated the lives of many fishing communities, while at the same time lining the pockets of ever more lawyers and professional lobbyists. Recent decades have seen a rapid development of political activity by environmental groups. This includes a plethora, indeed a new 'industry' of well-funded advocates, foundations, lawyers, lobbyists, and media that rivals the value of fish landed within these people's perceived domains of concern. The proliferation of the "Environmental Industry" has many fronts, and issues. Much of their activity suggests that to divide and conquer is one of the principal tools of their "big business plan". In what sense is the Alliance between an agency such as the NOAA/NMFS and the sport boat and gear industries in promoting sport fishing a positive objective in resource management? Are government agencies supposed to get into these sorts of alliances with competing sectors? Promotion of the collaborations between these agencies and commercial fishers to solve problems with gear would be more productive, in many instances, than turning the resource(s) over to the sports fishing industry through one-sided regulation and restrictions. Then, within the context of the 1996 Sustainable Fisheries Act (SFA) amending the 1976 M-SFCMA, the only option that fishermen have left to rescind too-hasty conclusions and the resulting management practices, is to file lawsuits within 30 days of the announcement of new regulations. This adversarial situation tends to displace any collaborative effort to gather real facts, and to improve interpretations of what are often only temporary changes in catch or landing statistics. A thorough contextual grounding can provide the understanding needed for a more enduring consensus on how to manage both our fisheries and common ocean resources. National initiatives to extend sovereignty over a larger portion of the coastal oceans, increasing political spheres of control from 12 miles to 200 miles, have resulted in a "gold-rush" mentality, under which both the United States and Canada created yet another set of problems for local fishing communities. The threat of foreign fleets, particularly those of the former Soviet Union, set in motion a bureaucratic effort to subsidize domestic fishing fleets - without any adequate understanding of fisheries contexts or of the ecological impact of these actions. To overlay a modern and heavily subsidized corporate fishing fleet onto existing subsistence fisheries - which had already been under periodic resource collapses stress since at least the late 19th century - caused widespread social misery and displacement of fishing cultures. This buildup of fishing capacity by government fiat was either an act of arrogant ignorance - or, more likely, of outright denial. The disastrous social consequences of these sudden fleet expansions have been already well documented, although blame has successfully been avoided by those in charge. The whole northwestern Atlantic fisheries social system is in a full state of crisis as a result of these follies. Only a few enterprising people who recognized the opportunity, and had access to the gear required to exploit it, went on to harvest the emergent species that would have been eaten by the now-depleted ground fishes. These fishermen have reaped great profits. What is being touted now is the fact that the combined value of these alternative fish resources is greater than that ever attained by the cod-based fisheries. Far too much has been made, however, of the balance sheet that shows the relative value of these catches. This sort of short-sighted financial emphasis - pursued and reported in the absence of any contextual understanding of climatic conditions or of socioeconomic effects - seems not just ïvena; it also does not bode well for the future viability of our ocean ecosystems. This concern is especially warranted as we whittle our way down Trophic Pyramids, congratulating ourselves for the unexpected benefits stemming from our management failures. This self-satisfied attitude also ignores and devalues the unestablished potential of yet another "natural" shift back to the "good old days" of former abundance. Our persistent ignorance of ongoing climatic and social consequences is becoming a major impediment to effective resource management. Then too, once any 'new' coastal population has made its inroads, the "not in my backyard" syndrome rears its little head, and various movements begin to curb otherwise important activities that were once cornerstones of local economies. Canneries are closed, night fishing is banned, and assorted other changes are sought that cause tension between earlier inhabitants, and the "new folk". Not surprisingly, the emphasis of fisheries management in the United States and Canada has shifted from partnering in ocean fisheries information gathering and collaborative research, to vessel buy-outs and an enormous emphasis on aquaculture, both nice management options on paper as well as in the bureaucratic mind, but hardly complete solutions to fisheries in and of themselves. Part of the failure implicit in this "solution" is an invalid perception that if one group can make aquaculture profitable, then anyone can do it. For example, as Alaskan salmon peaked in abundance over recent decades, there resulted a natural decline in the prices for salmon paid at the dock, due to market gluts. Simultaneously, Chilean farmed salmon nurtured on Chilean pelagic fishes, were shipped by air into world markets, selling at very reasonable and profitable prices. The less costly product was seen as a better all-round deal for consumers, even if the product is a bit less desirable by those who prefer the more flavorful "natural" fish. North America enjoys a much smaller pelagic fish resource for use as feed for the U.S. aquaculture industry. Also, most traditional fishermen in North America would resist mightily any transition from sailor-fishermen to coastal fish farmers, since their experience is more focused on fishing and boating skills which are not well-suited to the more domesticated activities involved in aquaculture. Oddly enough, most people do not have any conception about how much of western South America's fishmeal production goes to feed even Asia's aquaculture ventures. Despite these facts, there is a new and seriously misguided NOAA Sea Grant "aquaculture initiative" being flogged to the U.S. university system, which will squander more public funds on yet another unproductive venture advocated by special interests at taxpayers' expense. As little known is the fact that most of the shrimp aquaculture that blossomed in Asia during the 1980s was stimulated by a small coterie of U.S. fisheries scientists, sponsored by the Asian Development Bank. These same parties had failed in an earlier effort to stimulate similar activities within the United States, due to environmental violations, unresolved pollution issues, as well as threats to public health, such as the prevalence of Giardia in many aquaculture systems. The introduction of ocean fish culture in the 1850s by G.O Sars, in Norway, was among the first attempts to learn about fish life histories, and define those processes that Limit or promote their growth and survival. This was the basis of modern fisheries science. These studies results were applied in Newfoundland and in the USA in the late 1890s, to initiate fisheries enhancement activities in the New World. Why? Because the North Atlantic cod fisheries experienced major declines within this short period, and stock enhancement was deemed a realistic option. The basis of the idea was that if somehow you could bring the myriad fertilized eggs to advanced stages, by protecting them from "natural mortality" due to starvation and predation, you could restock the oceans. One hundred fifty years later, the experiments have become realities, particularly amongst the salmonids, shrimps, Tilapia, and carps, and enormous quantities of fish are 'produced' each year, at very good economic yields. 1. They affect domestic wild caught markets. 3. Introduction of feed-waste effluents, and resulting downstream disease, i.e., enhanced shellfish toxin. 4. Localization of income into non-community based systems, i.e., external ownership of facilities, etc. The long-term results are not all in, as this area of endeavor is growing, and patterns are just emerging, but it certainly appears that a lot more thought needs to be given to where new ventures should be allowed, and at what densities, under which specific conditions, and what consequences to expect. Much of the ongoing U.S. aquaculture is not economically competitive in international markets. Others, such as the abalone culture, has potential, if carefully organized, and not over-developed. The United States will likely never become a major fish culture production center, simply because so much of the clean freshwater resources of the continental United States are already spoken for. This factor alone implies that we will never be able to compete in aquacultural output with nations that have not already squandered their shoreline habitats to unregulated economic development (so major river flows are still relatively unimpeded), and that still enjoy sufficiently large pelagic fisheries resources to spare for use as feed in aquaculture. Such are the realities of a thriving urban civilization established along our nation's shorelines, limiting their ecosystem functions and minimizing their fish production capacity. What made the very same aquacultural programs effective in Asia, if for only a short time, was the availability of coastal environments (even if they had to destroy mangrove forests in the conversion process) , abundant seasonal fresh water supplies, and low-cost labor. Also, in Asia one finds a very old tolerance for lesser water quality and lower sanitation standards than most U.S. citizens enjoy. The recent collapses of entire coastal ecosystems in Asia have not received enough attention from the North American news media. Once again, too few of us in the United States have any adequate understanding of the potentially harmful ecological consequences of intensive aquaculture to insist on realistic planning and resource management programs, ones that will not jeopardize our existing fishing communities. Too many people have focused on commercial fishermen as the "root cause of fisheries declines." We suggest instead the need to recognize that cities along the shores and upstream agriculture - along with all those charter-boat fishers - have done as much or more damage to our fisheries stocks, and deserve a significant share of the "credit" for their harmful effects. If one were to do a proper accounting of the actual resource losses due to deterioration of essential habitat, water quality, and ecosystem health, then the impact on fisheries of people living and working along our waterways, coastlines, and tributaries of rivers running through farmlands would be a lot more heavily weighted in their overall contribution to fisheries stock collapses and other related problems. The expansion of railroads, farmlands, and the intense deforestation due to logging and other human activities initiated these downward trends, long before fishing communities became important entities. This is not meant to excuse the fishermen from their own more recent contributions to fisheries losses. A lot of damage was done during the periods following the fishermen's "discovery" of their own impact, despite their resulting attempts to repair these systems through better management practices. Frustrating the efforts of fishing communities to improve fishing practices were the political environments spawned by value-added industrial interests, which slowed or stifled any real progress toward these suggested improvements. The whole fisheries management system is in urgent need of reform. There is a growing recognition that many of the causes of natural changes in fisheries reproduction are not under human control. This realization has led to a drastic shortening of planning horizons in the fisheries management process, and the selection of near-term options at the expense of attention to long-term effects. Also, too many of these bureaucratic solutions created other problems. For example, the use of time and area closures has focused entire fleets onto critical spawning aggregations, creating even greater threats to fish populations and habitats. Changes of "ownership" and/or control of fishing can also be the source of vitally altered attitudes, shifting from more experienced fishermen with longer-range concerns for stewardship - who are willing to hold back a bit when resources decline - to total opportunism, with little regard for the future. Long planning horizons are shortened by competition, greed and all the uncertainties stemming from management failures. New "user groups" have also emerged, among whom many illogical declarations seem to hold sway. Fueled by a seductive mixture of half truths and real concerns, these more ïvena newcomers tend to accept vaguely optimistic promises stemming from misguided beliefs and hopes. This is not unlike the American fishermen of the 1960s, who were fed all sorts of tempting stories about how "the government was here to help them..." Many of these people eventually went broke, or lost their occupations following illusory management goals encouraged by unrealistic convictions stemming from primitive fisheries models and applications thereof. Today, we seem oddly unconcerned about oil industry drilling, even given the various public outrages and the resulting exclusions of offshore rigs, and especially after incidents like the Santa Barbara oil spill and the Exxon Valdez disaster. Many of our National Marine Sanctuaries and other environmental laws were developed to minimize the possibilities for oil extraction activities and the subsequent danger of destructive oil spills. As the price of oil continues to escalate supporters of these restrictions will likely wonder why their wishes are being ignored, when oil drilling resumes in defiance of these shortcomings. Is it any wonder that very brief (eight year) reauthorization procedures were incorporated into this legislation "just in case" another oil crisis occurs? The pending major increase in oil prices will likely undermine existing opposition to offshore drilling despite its potential fisheries consequences. Interestingly, most of the anti-drilling effort during the early 1980s stemmed from a coalition between fishermen and the environmental communities. Today, however, the scapegoating of fishermen for the failure of fisheries has an appearance of image manipulation, led by Rockefeller, Pew, and other foundations whose legacies were built from oil industry fortunes. This is either a very strange twist of fate, or reflects a successful plan to blame and discredit fishermen, in order to neutralize their opposition to new oil-drilling activities. This is a very sobering and frightening possibility. The recent hard-sell efforts in Louisiana by oil-drilling companies to convince the public that these standing rigs "...are good for fishermen" suggest another hidden purpose beyond the mere enhancement of fishing. It is well known that any structures, including oil rigs, tend to act as Fish Aggregating Devices (FADs), despite that they have little or no population enhancement effects, beyond acting as substrates for invertebrates such as mussels. Lobbyists seem ever present at most fisheries management meetings trying to convince fishermen and their managers that fisheries production is enhanced by the presence of oil rigs. The real motivation of this effort has more to do with avoiding costly gear removals once pumping has stopped than it does with fishing improvement! Similarly, the communications cable industries are currently experiencing unprecedented growth, in the laying of new optical fiber cables. The original cable-laying agreements included guarantees to fishermen that if their gear became entangled, the cable companies would cut it free and replace it with new fishing gear. Today's short-sighted investment-driven international cable consortia have ceased involving fishermen in the cable permitting negotiations, such that the onus has been reversed in the case of gear entanglements. Where are we headed, with these poorly conceived cost/benefit priorities? The tendency to blame and burden fishing communities with new problems not of their making creates an increasingly hostile environment for fishing activity onshore and at sea. The recognition that fisheries are affected by factors outside our control tends to shorten "planning horizons," i.e., near-term outcomes are overemphasized at the expense of attention to our actions' long-term effects. The point is that we react to uncertainty (especially regulatory and other environmental uncertainties) by shrinking our planning horizons, such that short-term motives increasingly dominate more sustainable practices. An example is that, instead of allowing a fishery to recover, fishermen often exploit the remaining, higher-value adults, when they should be left to support more rapid population recovery once environmental conditions shift again in their favor. One critical issue is that short-term economic accounting can become misleading, as "costs" are selectively sorted and weighed. If these accounts neglect the full range of relevant time and space scales, longer-range and distant harms can be slighted in favor of short-term benefits. This sort of myopia and narrow view of fisheries economics has been the focus of many remedial efforts over recent decades, such as Sweden's Natural Step and the recent development of the field of Ecological Economics, both seeking better alternatives. Their contributions fall within the rubric of System Science, but the new terminologies, mixed interests, and diverse planning horizons have too often failed to encompass all the critical processes and affected user groups. Any and all losses of trust in the fisheries management system only exacerbate this problem with extremely harmful effects. Beyond the immediate applications of selected economic criteria, the new "Whole System Economics" approaches are strongly resisted by traditional "market economists," whose tools are too often blunted by their own narrow focus and unresponsiveness to "economic externalities." These new systems analysts know that - not unlike in fisheries stock assessment methodologies - ignoring social and ecological contexts, leaving out critical forcing functions, and using mean-estimated values in parameterization of models, too often lead to losses of credibility in the results so derived. "Surprises" occur, in which the models are found not to fit empirical data and day-to-day observations over relevant time periods. Furthermore, a lack of insight into the real economic worth and ecological impact of habitat, water quality changes, or other major ecosystem variables is a part of this problem as well. Any absence of relevant information tends to justify yet another round of modeling and "parameterization," with the insertion of hypothetical place holders substituting for "truths." The major shortcoming of these efforts stems from the intransigent uniqueness of many fisheries systems (i.e., just because someone guessed that a value of 0.2 was good enough for one species as an estimate of natural mortality rate, M, is not reason enough for its extension to any other system). Consequently, far too often our models' results fail to correlate with what is observed, producing another round of credibility losses and their resulting regulatory enforcement problems. The outcome, much too frequently, is a power game for control over resources, which only appears to be a battle between fishermen and management. Ultimately, the public loses its trust in the fisheries management process, and becomes habituated to a generalized sense of betrayal caused by all this psuedo-science, persistently based on the use of false concepts at the cost of any real understanding of fisheries systems. Meanwhile, ever more models appear, each using less realistic data, often without any basis at all in direct observation. How do we rebuild trust once such losses of credibility occur? In the case of fisheries it will certainly require that fishermen be brought back into the analytical and data-gathering process, including recording and sharing observations and deliberating over how to interpret this information. We also need to bring more respectable science to bear on these problems, in lieu of the present process of modeling via trivialized models, without sufficient anthropogenic or environmental causality included to generate credible answers to our many unresolved questions. A direct partnership is needed between the scientific and fishing communities that will allow the expertise of fishermen (rather than fish buyers and processors) to mediate between the analytical science and the policy-making process. We must learn "How the System Works" and "Where the Push Points Are" that will allow us the insight we need to achieve a clearer prognosis of fisheries trends. Such a level of understanding calls for addressing our fisheries' complex interrelations with the whole ecological system and its diverse array of causal processes. Hindsight is inadequate for fisheries resource management purposes. Among the obvious examples are the surprises that too often results from Virtual Population Analysis. VPA is only as useful as the informational inputs on which it is based, and since both the newest and latter year classes are so often poorly represented, they tend to be highly variable, leading to many unexpected outcomes that further erode the scientific credibility of fisheries managers. So we come full circle, back to how to improve observing systems and information sharing, so that everyone is on the same wavelength, and working with credible information. The problem is that the present management process is a result of fundamental conflicts of view, with respect to priorities and understanding. Most of these disagreements are driven by too many different agendas and economic concerns to be easily resolved. One common division is between those seeking to learn and those wanting to protect our resources. There is also, for example, a huge disciplinary gap between biological oceanographers and fisheries scientists (fisheries biologists), as well as between their general philosophies and those of the "game warden" mentality of most state organizations. We have a lot of mending to do. 8. What Must We Do to Manage Our Fisheries? No one denies Man's abysmal record in the wanton, shortsighted destruction of natural resources. Habitats and water quality have suffered due to uncontrolled economic development, as we have expanded and colonized the world's shores and oceans. Yet fishermen used to be viewed as Heroes only a few decades past. Today, their image is being corrupted: they are recast as the Bad Guys. While many fishermen are continually being dispossessed, others around the world are hard at work constructing new fishing capacity! What is wrong with this picture? North America's fisheries were mostly based in local communities up through the 1950s. Since that time, they have developed destructively adversarial relationships with the fisheries management system. We must understand the causal factors behind these collapses of trust, and the associated breakdown of cooperative research and management activities. The passage of the M-SFCMA in 1976 (also the date corresponding to the beginning of a now well-recognized ocean climate regime shift - Ebbesmeyer, D.R. Cayan, D.R. McLain, F.H. Nichols, D.H. Peterson, K.T. Redmond. 1991. Forty environmental changes between1968-1975 and 1977-1984. In: Proc. Seventh Annual Pacific Climate Conference (PACLIM) Workshop, April 1990. Calif. Dept. of Water Resources. Interagency Ecological Studies Program Tech. Rep. 26, 115-126. 26, 115-126) seems to have accelerated the decline in community fisheries, and opened a widening rift between fishermen and fisheries scientists. What is the goal of fisheries management? How do we inspire a better sense of cooperation and trust between the fisheries management system and those out on the water, and get beyond today's use of logbooks and observer-based enforcement tools? And how do we start to manage the other non-fisheries sources of harm? Our current fisheries management system is almost exclusively focused on the regulation of fishing effort and catch, with far less attention to the other parts of the process, with respect to either oceanic climate cycles or downstream market forces. As a result, the complex economics of fish processing and distribution - along with the increasing globalization of fisheries markets - have received insufficient attention despite the role of growing market demand in the decline of worldwide fisheries. The whole economic context of fish consumption from harvest to plate deserves a lot more attention than it has had to date in fisheries science. For example, the social impact of various schemes for the "privatization" of fisheries, and the rapid internationalization of fisheries markets through low transport costs, are in need of much closer scrutiny. A socio-cultural shift of fishing activity away from local communities into the hands of multinational, vertically integrated "seafood producers" has had devastating effects on the manageability of these activities all over the world. The decline of ocean fisheries is not just due to overfishing by an inadequately regulated harvesting sector; the whole apparatus of market forces should be more closely examined with regard to its sweeping effects on the intensity and specific character of fishing activity. Only if addressed in full context can our fisheries management system become more effective in the protection of our ocean resources. Simplistic scientific constructions and resource management approaches have failed dramatically, and have focused attention away from market forces and climatic cycles in their impact on fisheries. Only when tied to a larger vision of how the whole system works together will the tools of fisheries management ever succeed in their overall aims. Single-species approaches - without regard to other encompassing aspects - simply provide just one example of the problem at hand. A global long-term perspective is needed for proper regulation of ocean ecologies, along with a far better understanding of market processes and climatic contexts. Otherwise, potentially useful options are never explored or developed, such as those involving production enhancement of ocean resources. The Chinese have integrated their carp and rice cultures for more than four thousand years. The field of modern fisheries science began in the mid-1800s, with G.O. Sars' work on cod, and continued for over 100 years from Gundar Dannevig's initial cod culture and release program at Flodevigen, Norway. Their ideas and procedures were exported to North America, first appearing in Newfoundland, and then under what became known as the Woods Hole Oceanographic Institute. Salmon culture began during the 1880s in Northern California, and quickly expanded to other U.S. areas and abroad. The recent developments in Chile provide a unique insight into the requirements and the consequences of raising exotic species. Compared with the extensive growth of shrimp culture in Asia, Central America and Ecuador, the spread of salmon aquaculture is limited by its cold-water requirements, although it has proven nearly as problematic, due to the dangerous spread of disease, habitat invasions, and hybridization due to escapements. Despite these shortcomings, government promotion of aquaculture continues. The impact of human organic waste on ocean ecosystems has had divergent effects, depending on the nature of the pollution and many other contextual factors. The eastern Mediterranean and parts of the North Sea fisheries production have apparently benefited from eutrophication due to civilization's wastes. In contrast, the Black Sea fisheries have suffered a dramatic collapse and habitat loss from eutrophication and introduction of an exotic comb-jelly species that feeds on small organisms, including fish larvae. What about other production enhancement options, such as the late John Martin's iron fertilization of the oceans, or other similar efforts? Although the concept has been proven, its long-term consequences remain unknown. As Martin himself posited: Add enough iron, and we will have another "Ice Age" as a consequence of removal of atmospheric CO2 by oceanic algae. Are we really ready to introduce this sort of global "uncertainty"? We believe not, although perhaps some further small-scale experimentation is warranted on this approach. We advocate that all fishery enhancement activities should be examined to see if they make good long-term economic and ecological sense. To date, salmon enhancement activities along the western coast of North America have been heavily subsidized; combined with the manipulation of waterways, and widespread damming for hydro-power and logging, the result has been undeniable ecological chaos. Clearly salmon have been treated as an inferior resource, or these other economic activities - so harmful to natural salmon spawning runs - would have been disallowed, or at least subject to severe restriction. The end result has been the creation of another political culture, an "Industry of Advocacy," of NGOs with their legal advisers and lobbyists, and an array of fish transport facilities to maintain some semblance of "natural salmon" production from what little remains of their original spawning habitats. The results have been totally uneconomic compromises of irreplaceable natural living processes. Carefully controlled, thoughtful economic development, with strong empirical scientific grounds of justification, ought to be welcomed, but closely managed. To ravage our environmental processes for short-term private gain, without any clear understanding of the enduring effects of human disruptions, simply will lead to folly and enduring ecological loss. The problem is that we do not see these effects until far too late. Only a long-term planning process, based on intelligent theory and as careful observations as possible, gives us any hope of protection from these irremediable losses. In order to emerge from the current quagmire of conventional management processes and failures, a lot of very pointed, if simplified, lobbying must take place that addresses these more enlightened possibilities. We must quickly but carefully promote credible empirical methods for estimating the impacts of various resource management options. A clarity of purpose and thought is needed to meet this important challenge. First, we must decide what we want our fisheries to look like, over various time frames, location by location. Rational management will only result from better definitions of vital processes and the causal determinants of our resources' abundance. Such an undertaking ought to be done without political pressures to do more with less, if realistic solutions are the goal. A proper attribution of cause and effect will likely provide insight into both the burdens of proof and the important requirements for adequate evidence in support of what should be done. The kinds of thinking applied to fisheries management must quickly evolve from a narrow focus on single species to an ecosystem-based logic. The Atlantic seaboard provides several good examples of possibilities that have not been recognized or accepted as potentially useful solutions. The transition from a system dominated by valuable species over "trash fish" should be assessed and reevaluated, in its potential effects on a fishery. The immense biomasses of juvenile dogfish on the banks, as well as the two million tons of mackerel swimming in the upper water column, presently act as suppressing influences on more valuable species. Can their exploitation rates be manipulated such that these other, more valuable trophic components might again emerge? Can they perhaps be utilized as resources for stock enhancement activities, as is done with sardines, jack mackerel, and anchoveta from Chile and Peru? Systems solutions require Systems Thinking, and the first step is by necessity an abandonment of simplistic single-species conceptions. We also need to develop procedures and strategies for managing fisheries within naturally varying climatic contexts, rather than primarily for "stable" equilibrium systems. We humans must come to understand and acknowledge our own ecological impact, and accept our roles as competitors in finite ecosystems. This is the first step toward rebuilding our mental models, based on a more complex systems approach. Observing systems must be rebuilt to provide information needed to understand the whole fisheries setting, from climate and habitat variabilities of living ecologies, through actual captures and landings, to subsequent market transactional patterns, and begin to develop proper economic accounts of full (private and social) costs and benefits at each stage of the process. A growing sense of the need for more and better information to manage fisheries and other living resources has prompted a movement by physical scientists and aquatic ecologists to work together to enhance our global environmental observation system, (i.e., GLOBEC, GOOS, Census of Marine Life). The direct application of ocean and atmospheric information in tracking and explaining fishery-independent changes in aquatic ecosystems is a worthy common goal for researchers and for responsible agencies, which should be encouraged through public and private research funds. However, the fact that such measures must be multidisciplinary in their pursuit and use needs to be more clearly understood by those in charge of fiscal resources. Research on planetary (orbital, solar and lunar) climate cycles, as they affect ocean ecologies and fisheries in particular, has just begun to gain recognition as critical to their sustainability. Our understanding of food webs and how they evolve through time is certainly only in its earliest stages. How ecosystems are affected by diverse factors, beyond just fisheries removals, should become our highest priority. The proper research has hardly started on these important domains of inquiry! 8. Wholesale/Retail Sales Point Data (local, regional, national, international) for all harvested species. These sorts of scientific data are necessary for realistic, useful (operational) fisheries ecosystem analyses, and management, if surprises and disappointments are to be minimized. This carefully implemented plan will allow fish and fisheries to thrive, and public decisions to be made on reasonable grounds based on a proper understanding of ocean ecologies and other relevant factors. An honest, strong, open political leadership must emerge in order to rebuild these observational and record-keeping activities, and to initiate the necessary monitoring at each market step, in order to make all this happen. Such leadership must encourage and nurture all participants, not just one side or the other, of the various partnerships involved. If this change cannot be implemented expeditiously, we are headed for some major sociological disruptions and ecological collapses in the very near future. This impending crisis has very little to do with the many positive virtues of a "free market" system. Rather, what is called for here - in the language of Systems Theory - is a tightening of "feedback control loops" by enhancing observational capabilities in very localized contexts to create more manageable outcomes for our ocean fisheries. The time is far too late for the standard array of excuses for any continued inaction. There is no way to rebuild trust in this "broken system" without setting a better example of integrity throughout the management process. Dishonesty only spawns dishonesty, and such can only thrive in Darkness. Shine a light on this system - make it transparent - and it will have to improve. All must be done in the open, with fully inclusive participation and collaboration, rather than through the competitive, conflict-laden environment that presently dominates fisheries negotiations. There is almost always an obvious answer, if everyone shares sincerely in a common objective: survival of fishes and fishing communities. We made no attempt to come to final closure in the course of this meeting, as our near-term objective was to get the group's thoughts out on the table, and to see what they were. The results have been most gratifying. The urgent need for a general attitude favoring collaboration suggests that there must be a better dialogue between fishermen and fisheries managers, without interference from middlemen, politicians and other commercial or economic interests. Response time between perceived needs and remedial actions must be decreased dramatically to be effective. This can only be accomplished by encouraging continued learning, and far better interdisciplinary integration of empirical knowledge. One experimental option would be to strip authority from state and federal fisheries managers within certain case study areas, in order to explore a more broadly-based fisheries co-management structure attentive to wider ranges of common interest. Gear-specific concerns should be addressed with regard to their ecological long-term impact on fisheries habitat and reproduction, within a longer horizon frame. The whole effort should be assessed with respect to its planning horizons, i.e., in terms of the scope and range of effects taken into account in whatever decisions emerge. The ultimate goal ought to be an adaptive fisheries management system based on a co-management process by an open community of interests, seeking to devise solutions within the largest perspective that our full understanding and knowledge allow. Any such system must evolve "in place" to fit the needs of fisheries in specific contexts and local community settings, and yet take into account the global effects of fishing and other resource-related activities so allowed. How regional/local effects are reconciled with global impacts under ecosystem-based management oversight ought to be monitored closely by international and national authorities, as needed under this system. The various stresses and pressures involved will only be settled, however, within a context of full understanding based on accurate and honest science, and a resolve favoring environmental health above all else. Scientific credibility and a commitment to larger perspectives are essential conditions for the success of any such effort. What is proposed above is not just a "fix" for fisheries management problems, but rather a "framework for thought and action," under which many different solutions should emerge on an ongoing basis, adapted to diverse settings and socio-ethical cultures. We need help designing models for use in developing these solutions, as well as in identifying potential fisheries situations as candidates for experimental case studies. The goal here is to try new things on an experimental basis, so we can develop better role models for localized observing and management systems, most likely within a culturally collaborative set of communities, such as among those fishing for NJ scallops, Pacific swordfish, etc. Information transfer, i.e., open and honest sharing of knowledge, arises from sincerely collaborative activities rather than from competition, abuses of market power and the array of economic insecurities stemming therefrom. As such, shortsighted exploitative values should be seen as part of the problem to be addressed, and displaced by an honest scientific grasp of far reaching ecological, ethical and social impacts in their real long-term effects. Systems thinking calls for larger perspectives than we may be accustomed to in our fast paced lives, so the point is worthy of emphasis here. Indeed, a large part of the source of fisheries degradation - if not of all ecological losses anthropogenically caused - is our own economic myopia. Any substantive change in fisheries management styles and approaches should be based on and reflect longer planning horizons and a larger range of perspectives than we have seen during the past several decades. There are many other things in need of revision as well, that are all part of the General Systems Approach that we support. Attention to the ecological impacts of various methods of fishing ought to be a high priority, as should the socioeconomic and cultural settings in which fishing activity occurs. Perhaps the most immediately achievable part of the program being proposed here is the informational effort to gather and incorporate oceanic climatic data in the fisheries management process. A few final words seem warranted on this important topic. SHIFT HAPPENS: The ocean fisheries pattern prevailing during the 1940s and 50s has changed; the 1976 climate shift, and other ongoing adaptations, suggest that the broad temporal dynamics of these complex systems should be a part of fisheries models and the management process. 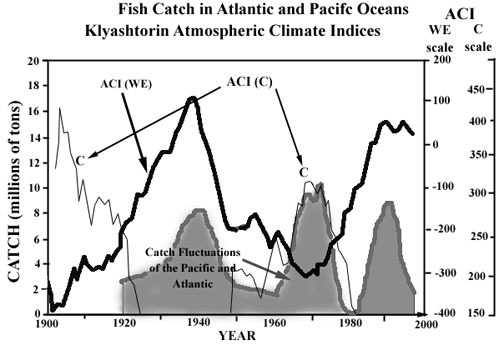 The more productive Cold Phase of the Klyashtorin /Girs Atmospheric Climate Index that prevailed during that period was in transition from the late 1960s, toward the Warm Phase, during which the various Pacific sardine populations and their counterparts, bloomed. At peak production, they were less abundant than the cold Phase components. The sardine epoch began to decline again in the late 1980s or so, as we transition into the next warm Phase. Ecosystem stability can no longer remain our objective, or serve further use as the assumed context of fisheries science. Furthermore, if adequate monitoring of market forces were introduced, with flow-through controls throughout the full economic process by which fish move from ocean to plate, then the options for other experimental developments could be preserved and pursued to everyone's benefit. Flexibility of both markets and fisheries systems could allow us to adapt to cycles of both scarcity and abundance of fishery products, while providing us with a variety of value-added options. U.S. fishermen seem to retain less of the value of final products than in most other fisheries communities. This suggests an opportunity for reexamining fisheries markets and the role of economic power in its organization and distribution of benefits. In general, the failure of fisheries management efforts since the passage of the M-SFCMA has not been due primarily to incompetence, dishonesty or any undue influence of economic and political interests, though all three have had a role in the deplorable outcomes achieved. Instead, the primary cause of the problem has been narrow outlooks, supported by pseudo-scientific constructions scornful - or at least skeptical - of fishermen's data, experience and knowledge, and built instead on unrealistic assumptions in too limited frames. Single-species approaches should be abandoned for ecosystem models accounting for interdependent fisheries, food webs and evolving climatic conditions at the least. The need for widely disparate disciplines to work cooperatively, in a well-coordinated data gathering and processing effort, seems so obvious that it shouldn't need mention, except that it does. Most of what should be done is nothing more than simple common sense, and yet it encounters so much resistance in some management circles, one is driven to wonder about the source of this stubborn institutional inertia. It is a fundamental lesson of organizational theory that the prime directive of every organic and social system is self-preservation; that when an institution is faced with the need to adapt to changing conditions, it often erects strongly intransigent defenses against these pressures instead. This appears to be the case with our fisheries management system, and it is long past time to admit the need for a different and better approach. The system is broken; it needs to be fixed, while we can still recapture at least some of the ecological losses stemming from mismanagement. FUTURE PLANS: We intend to reconvene for a second discussion on these subjects in the near future, that will include a group of senior scientists and fishermen to address the changes in ocean and atmospheric environmental information gathering, dissemination, and use in strategic fisheries operations, fisheries management, and long-term prognostication. People contacted or in the area that are interested to date include: Bob Jones, Frank Hester, Glenn Flittner, Paul Wolff, Taivo Laevastu, James Johnson, Frank Martin and some local experts in fisheries oceanography and aquatic ecology. Our intent is to maintain a low profile, while widening our subject matter to help define basic requirements for a better informed, more realistic, and intellectually open resource and fisheries management approach. This shift to a systems view would serve multiple functions including enhancement of ocean observation and production by participating fishing communities in partnership with management agency scientists. Discussions of how to implement market flow management methods will continue as well, in this series of future discussions, once the data-gathering and scientific basis of fisheries management choices have been more clearly analyzed to set the context for a more rational economic consideration of how these markets should function.